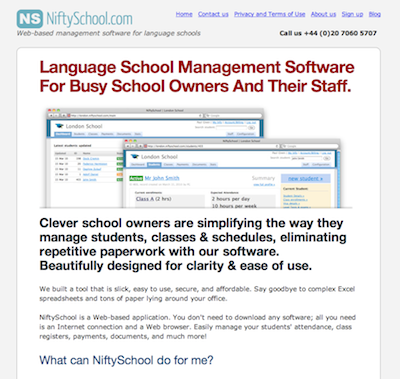 NiftySchool is an online administration tool for language schools. It simplifies management of your students, class schedules, documents, payments and all of the administration that a school necessarily needs. It also provide nice reporting and key performance indicators of how your school is doing. Most of the software for language schools are old desktop based applications that are both expensive and difficult to use. NiftySchool is slick, intuitive and with its monthly subscription plan does not require a big initial investment. All of your staff members, including teachers, receptionists, managers can access the system from the office and from home enhancing collaboration and removing unnecessary paperwork, like daily/weekly registers etc. Next post: Weburlopener.com – Open Multiple Websites At a Blink of an Eye!